If you look up at the sky on a starry evening you can probably pick out the Big Dipper or, if in the Southern Hemisphere, the Southern Cross. You may not be aware, however, that two greyhounds romp among the stars. The stars were indispensable to early navigators who had to find their way without the benefit of satellites, computers or radar. Somewhat frightened by things that they could not understand, early people like the Greeks and Romans interpreted the heavens and the various patterns of stars in ways that they could understand. They did this by visualizing powerful gods, a regular zoo of animals, and other objects amongst the groupings of stars we know today as constellations. Four of these celestial animals are dogs and two of these dogs are greyhounds. The two more famous sky dogs are Canis Major and Canis Minor. These are the companions of Orion the Hunter. Orion and his dogs are a winter constellation which rises in the east shortly after sunset and is visible all night until about the middle of May. Canis Major, the greater dog, contains the brightest star visible to our eyes which is known as Sirius, the Dog Star. In early Egypt, Sirius heralded the summer solstice and the “dog days” of summer. Canis Major is usually portrayed rearing on his hind legs and about to pounce on something, possibly Lepus the hare which is located near Orion’s feet. The smaller dog, Canis Minor, is more of a pet and is sometimes portrayed lifting a paw to shake or beg. Lesser known than Orion’s sky dogs are the two dogs of Bootes (pronounced bow Oh teez). 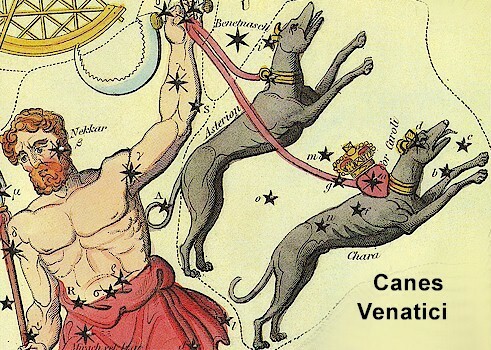 These dogs, the Canes Venatici (pronounced KAY neez VEN at ih see) are greyhounds. Bootes is a summer constellation and was known in antiquity since it is mentioned in Homer’s Odyssey. In Book V, Odysseus sailed his ship by the stars and uses the Pleiades, the Bear, and Bootes to guide him to his destination. Bootes is sometimes referred to as The Hunter and sometimes The Herdsman. He is most often pictured as a white-bearded man holding a staff in one hand and two leashes in the other. At the end of the leashes are his two hunting dogs running side by side. These are the greyhounds, Asterion which means Starry, and Chara, which means Dear One. Bootes and his greyhounds continually pursue Ursa Major (the Great Bear), whose tail is the Big Dipper, as he circles the North Pole. To find these heavenly greyhounds, look beneath the curving tail of the Great Bear. The two brightest stars of the Canes Venatici are in the heads of the dogs. These are Cor Caroli, the brighter of the two, and La Superba, which changes colors. In case you lack the imagination necessary to spot these heavenly greyhounds, a drawing of Bootes and his two greyhounds is shown here. This drawing is attributed to Johannes Hevelius and dates back to 1690.